Ben Templesmith: A sign of things to come on my blog. A sign of things to come on my blog. Much much more up on the blog soon. 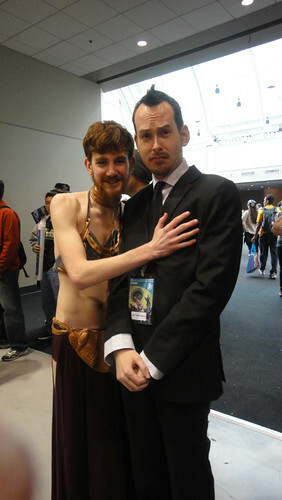 Yes, he's wearing a Princess Leia slave girl outfit. Yes, I was slightly uncomfortable. Just SLIGHTLY. CHOKER tour nearly done... my body is battered and broken. Big updates soon but a huge thanks to all who came out to see McCool and I. How us horrible bastards can have such nice fans I'll never fathom. You all rock the awesome sauce. And this is why ECCC10 was a blast! And this was posted on Warrenellis.com. I just can't seem to run fast enough away from this image. Scenes From The Road 6 Anchorage.